"US-1" redirects here. For the Japanese US-1 flying boat, see Shin Meiwa US-1A. For the comic book, see U.S. 1 (comics). 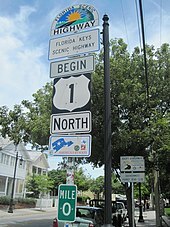 U.S. Route 1 (US 1) is a major north–south U.S. Highway that serves the East Coast of the United States. It runs 2,369 miles (3,813 km), from Key West, Florida north to Fort Kent, Maine, at the Canada–US border, making it the longest north–south road in the United States. US 1 is generally paralleled by I-95, though the former is significantly farther west (inland) between Jacksonville, Florida, and Petersburg, Virginia. The highway connects most of the major cities of the East Coast—including Miami, Jacksonville, Richmond, Washington, D.C., Baltimore, Philadelphia, New York City, Boston and Portland, passing from the Southeastern United States to New England. While US 1 is generally the easternmost of the main north–south U.S. Highways, parts of several others occupy corridors closer to the ocean. When the road system was laid out in the 1920s, US 1 was mostly assigned to the existing Atlantic Highway, which followed the Fall Line between the Piedmont and the Atlantic Coastal Plain north of Augusta, Georgia. At the time, the highways farther east were of lower quality and did not serve the major population centers. Construction of the Interstate Highway system gradually changed the use and character of US 1, and I-95 became the major north–south East Coast highway by the late 1960s. US 1 travels along the east coast of Florida, beginning at 490 Whitehead St. in Key West and passing through Miami, Hollywood, Fort Lauderdale, Boca Raton, West Palm Beach, Jupiter, Fort Pierce, Melbourne, Cocoa, Titusville, Daytona Beach, Palm Coast, St. Augustine, and Jacksonville. The southernmost piece through the chain islands of the Florida Keys, about 100 miles (160 km) long, is the two-lane Overseas Highway, originally built in the late 1930s after railroad tycoon Henry Flagler's Florida East Coast Railway's Overseas Railroad, which was built 1905-1912 on stone pillars was ruined by the Labor Day Hurricane of 1935. The rest of US 1 in Florida is generally a four-lane divided highway, despite the existence of the newer I-95 not far away. Famous vacation scenic route Florida State Road A1A is a continuous oceanfront alternate to US 1 that runs along the beaches of the Atlantic Ocean, cut only by assorted unbridged inlets and the Kennedy Space Center at Cape Canaveral. North of Jacksonville, US 1 turns northwest towards Augusta, Georgia; US 17 becomes the coastal route into Virginia, where US 13 takes over. 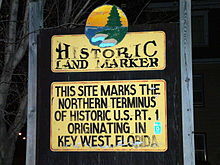 In Florida until the 1990s, US 1 used high-contrast markers (white text on a red background). The part of US 1 in Georgia, as it shifts from the coastal alignment in Florida to the Fall Line alignment in South Carolina, is generally very rural, passing through marshes and former plantations between the towns and cities of Folkston, Waycross, Alma, Baxley, Lyons, Swainsboro, and Augusta. The Georgia Department of Transportation has an ongoing plan to widen all of US 1 to four lanes with bypasses which is more than 50 percent complete. In South Carolina, US 1 generally serves mostly rural areas as it falls west of I-95 while the coastal areas are served by routes east of it. Starting in South Carolina, US 1 is paralleled by Interstate 20 along the Fall Line through Aiken, Lexington, and Columbia to Camden and Lugoff. US 1 functions as a local two-lane road with occasional boulevard stretches. After Camden, US 1 continues northeast away from any Interstate towards Bethune, Patrick, McBee and Cheraw with no bypasses or four-lane sections except around Cheraw through the US 52 and SC 9 multiplexes. After SC 9, it continues northward into North Carolina as a two-lane highway. SCDOT has no plans to widen or bypass any US 1 alignments northeast of Camden to the North Carolina line. Between the South Carolina line and the US 74 bypass, US 1 is a two-lane road but sees a considerable amount of truck and tourist traffic of people cutting through from the US 74/US 220 and I-73/I-74 corridor attempting to reach points south and east. US 1 goes through downtown Rockingham, with a bypass in the future plans. North of the NC 177 junction, it becomes four lanes or greater, becoming a super-street with limited access and then becoming a limited access freeway. US 1 becomes a major artery for the state as it moves north of Rockingham. After Richmond County, it goes into Moore County with two expressway bypasses in Southern Pines, Vass and Cameron. US 1 continues with the Jefferson Davis Highway label through Lee County and Sanford, and on to Cary and Raleigh. US 1 runs concurrently with US 64 through most of Cary, where the freeway recently underwent a major renovation and improvements that added lanes in both directions. North of Raleigh, US 1 (known as Capital Boulevard in northern Wake County) crosses Interstate 540 and then again becomes a four-lane divided arterial to Interstate 85 near Henderson. 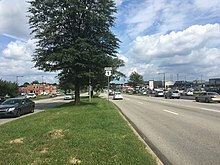 The North Carolina Department of Transportation has begun a corridor study for this section of US 1. Moreover, NCDOT is planning to finish four-laning US 1 in Richmond County past NC 177 with a Rockingham bypass to the east. There are no plans from SCDOT to widen US 1 from the state line. From Henderson into Virginia, US 1 runs parallel with I-85 as a two-lane local road until the state line, where Virginia hosts a continuous third center lane for alternate passing towards US Highway 58 before South Hill. The two-lane US 1 becomes a four-lane expressway, officially known as the John H. Ware III Memorial Highway, just after crossing into Pennsylvania. This bypass extends around Oxford and Kennett Square, merging into the four-lane divided Baltimore Pike just beyond the latter. At Media, US 1 again becomes a freeway – the Media Bypass – ending just beyond Interstate 476. After several name changes, the road becomes City Avenue, the western city limits of Philadelphia, at the end of which a short overlap with the Schuylkill Expressway (I-76) leads to the Roosevelt Expressway and then the twelve-lane Roosevelt Boulevard partly overlapping US 13. US 1 again becomes a freeway after leaving the city, bypassing Penndel and Morrisville and crossing the Delaware River into New Jersey on the Trenton–Morrisville Toll Bridge. After crossing into New Jersey in Mercer County, US 1 continues on the Trenton Freeway through the state capital city of Trenton and Lawrence as a four lane freeway. As the freeway ends, the four lane divided highway upgrades to six lanes north of I-295 passing through the Penns Neck section of West Windsor Township. Through Penns Neck is a series of traffic signals. NJDOT is looking to revamp the highway through this area by replacing traffic signals with grade separations. The highway enters Middlesex County through Plainsboro and South Brunswick, where the highest point resides. By Forrestal Village, the highway downgrades from 6 to 4 lanes until after Finnegans Lane in North Brunswick. Northward, it continues through New Brunswick as a short jersey-freeway until the CR 529/Plainfield Avenue traffic signal in Edison. Through Edison and Woodbridge has a mix of boulevard and jersey freeway segments and continues to do so after the US 9 juncture in the Avenel section of Woodbridge. The US 1/9 concurrency continues through the rest of the state. The six lane divided highway remains through Rahway in Union County and Elizabeth, until it reaches the Newark Airport, where it becomes a dual carriageway freeway around downtown Newark in Essex County with a 2-2-2-2 configuration. The historic Pulaski Skyway takes US 1/9 into Jersey City, and the route exits the freeway at Tonnele Circle to head north into Bergen County. US 1/9 turns onto US 46 as a jersey-freeway, and the three routes run northeast to the George Washington Bridge Plaza, where they merge into I-95. US 46 ends in the middle of the bridge, which crosses the Hudson River into New York, and US 9 exits just beyond onto Broadway in Manhattan, but US 1 stays with I-95 onto the Cross Bronx Expressway, exiting in the Bronx onto Webster Avenue. Two turns take US 1 via Fordham Road to Boston Road, which it follows northeast out of the city to the state line, never straying far from I-95. As it enters Greenwich, Connecticut, it continues as a two lane local road. In New England, US 1 generally serves large cities in a side street capacity. In Connecticut, US 1 serves the shore of the Long Island Sound parallel to I-95. Beyond New Haven, the highway travels east–west, and some signs in the state indicate this rather than the standard north–south. While I-95 in Rhode Island takes a diagonal path to Providence, US 1 continues east along the coast through Westerly to Wakefield, where it turns north and follows Narragansett Bay. Most of this part is a four-lane divided highway, providing access to Route 138 towards Newport. After Route 4 splits as a mostly-freeway connection to I-95, US 1 becomes a lower-speed surface road, passing through Warwick, Providence, and Pawtucket. The route parallels I-95 again through Providence and Pawtucket and into Massachusetts, traveling towards Boston as a four-lane road. When it reaches Dedham, US 1 turns east, overlapping I-95 and I-93 east to Braintree and north through Downtown Boston. The Tobin Bridge and Northeast Expressway take US 1 out of Boston, after which it again parallels I-95 through Newburyport to the New Hampshire state line. The short portion of US 1 in New Hampshire follows the historic Lafayette Road, staying close to I-95, passing through Portsmouth before crossing the Piscataqua River on Memorial Bridge, which was demolished and replaced during 2012–13, leaving a temporary gap in US 1. 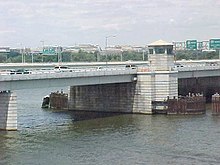 During construction, drivers had to detour to one of two other nearby bridges carrying U.S. Route 1 Bypass or Interstate 95. Within Maine, US 1 begins as a parallel route to I-95 near the Atlantic Ocean. At Portland, I-95 splits off to the north, and I-295 heads northeast paralleling US 1 to Brunswick. There US 1 turns east as a mostly two-lane road along the coast to Calais; much of this portion is advertised as the "Coastal Route" on signs. North from Calais, US 1 follows the Canada–US border, crossing I-95 in Houlton and eventually turning west and southwest to its "north" end at the Clair-Fort Kent Bridge in Fort Kent. The short Route 161 extends north on the New Brunswick (Canada) side of the bridge to Route 120, a secondary east–west route from Edmundston, New Brunswick west to Quebec Route 289 toward Saint-Alexandre, Quebec. The direct predecessor to US 1 was the Atlantic Highway, an auto trail established in 1911 as the Quebec-Miami International Highway. In 1915 it was renamed the Atlantic Highway, and the northern terminus was changed to Calais, Maine. Due to the overlapping of auto trail designations, portions of the route had other names that remain in common use, such as the Boston Post Road between Boston and New York, the Lincoln Highway between New York and Philadelphia, Baltimore Pike between Philadelphia and Baltimore, and the Dixie Highway in and south of eastern Georgia. North of Augusta, Georgia, the highway generally followed the Eastern U.S. Fall Line, rather than a more easterly route through the swamps of the Atlantic Coastal Plain. Brickell Avenue is the name given to the 2.4-mile (3.9 km) stretch of US 1 in Miami, Florida, just south of the Miami River until the Rickenbacker Causeway. When the New England road marking system was established in 1922, the Atlantic Highway within New England was signed as Route 1, with a Route 24 continuing north to Madawaska; New York extended the number to New York City in 1924 with its own Route 1. Other states adopted their own systems of numbering, and by 1926 all states but Maryland had signed the Atlantic Highway as various routes, usually changing numbers at the state line. In 1925, the Joint Board on Interstate Highways created a preliminary list of interstate routes to be marked by the states, including US 1 along the Atlantic. This highway began at Fort Kent, Maine, and followed the existing Route 24 to Houlton, and Route 15 to Bangor, beyond which it generally followed the Atlantic Highway to Miami. In all states but Georgia that had numbered their state highways, Route 1 followed only one or two numbers across the state. The only significant deviation from the Atlantic Highway was between Augusta, Georgia, and Jacksonville, Florida, where Route 1 was assigned to a more inland route, rather than following the Atlantic Highway via Savannah. One of the many changes made to the system before the final numbering was adopted in 1926 involved US 1 in Maine. The 1925 plan had assigned US 1 to the shorter inland route (Route 15) between Houlton and Bangor, while US 2 followed the longer coastal route via Calais. In the system as adopted in 1926, US 2 instead took the inland route, while US 1 followed the coast, absorbing all of the former Routes 24 and 1 in New England. 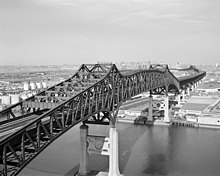 Many local and regional relocations, often onto parallel superhighways, were made in the early days of US 1; this included the four-lane divided Route 25 in New Jersey, completed in 1932 with the opening of the Pulaski Skyway, and a bypass of Bangor involving the Waldo-Hancock Bridge, opened in 1931. The Overseas Highway from Miami to Key West was completed in 1938, and soon became a southern extension of US 1. With the construction of the Interstate Highway System in and after the 1950s, much of US 1 from Houlton to Miami was bypassed by Interstate 95. Between Houlton and Brunswick, Maine, I-95 took a shorter inland route, much of it paralleling US 2 on the alignment proposed for US 1 in 1925. Between Philadelphia and Baltimore, I-95 leaves US 1 to pass through Wilmington. Most notably, I-95 and US 1 follow different corridors between Petersburg, Virginia, and Jacksonville, Florida; while US 1 followed the Fall Line west of the coastal plain, I-95 takes a more direct route through the plain and its swamps. Although some of this part of US 1 was followed by other Interstates—I-85 between Petersburg and Henderson, North Carolina, and I-20 between Camden, South Carolina and Augusta, Georgia—the rest remains an independent route with four lanes in many places. By the late 1970s, most of I-95 had been completed, replacing US 1 as the main corridor of the east coast and relegating most of it to local road status. US 90 in Jacksonville. The highways travel concurrently through the city. US 17 in Jacksonville. The highways travel concurrently through the city. US 23 in Jacksonville. The highways travel concurrently to north of Alma, Georgia. US 301 in Callahan. The highways travel concurrently to Homeland, Georgia. US 82 in Waycross. US 1/US 82/SR 520 travels concurrently to west of Deenwood. US 84 in Waycross. The highways travel concurrently through the city. US 221 in Louisville. US 1/US 221 travels concurrently to Wrens. US 78 / US 278 in Augusta. US 1/US 78 travels concurrently to Aiken, South Carolina. US 1/US 278 travels concurrently to Clearwater, South Carolina. US 1/SR 10 travels concurrently to the South Carolina state line. US 25 in Augusta. US 1/US 25 travels concurrently to North Augusta, South Carolina. US 1/SR 121 travels concurrently to the South Carolina state line. US 378 in Lexington. The highways travel concurrently through the city. US 378 in West Columbia. The highways travel concurrently to Columbia. US 76 in Columbia. The highways travel concurrently through the city. US 601 in Lugoff. The highways travel concurrently to Camden. US 52 south-southwest of Cheraw. The highways travel concurrently to Cheraw. US 15 / US 501 in Aberdeen. The highways travel concurrently through the city. US 15 / US 501 north-northeast of Cameron. The highways travel concurrently to Sanford. US 64 in Cary. The highways travel concurrently to Raleigh. I‑40 / I‑440 / US 64 in Raleigh. I-440/US 1 travels concurrently through the city. I‑440 / US 401 in Raleigh. US 1/US 401 travel concurrently through the city. US 158 northeast of Henderson. The highways travel concurrently to Norlina. US 158 / US 401 in Middleburg. US 1/US 401 travels concurrently to north-northwest of Wise. US 58 southwest of South Hill. The highways travel concurrently to just southwest of the city. I‑85 / US 460 southwest of Petersburg. US 1/US 460 Bus. travels concurrently to Petersburg. US 301 in Petersburg. The highways travel concurrently to Richmond. US 17 east-northeast of Spotsylvania. The highways travel concurrently to south of Fredericksburg. I‑395 in Arlington. The highways travel concurrently to Washington, D.C. US 50 in Washington The highways travel concurrently through part of the city. US 29 in Washington The two highways bump into each other at the intersection of 6th Street NW and Rhode Island Avenue NW. US 202 / US 322 in Concordville. US 1/US 322 travels concurrently through the community. I‑76 on the Bala Cynwyd–Philadelphia city line. The highways travel concurrently into Philadelphia proper. US 13 in Philadelphia. The highways travel concurrently through part of the city. US 9 in Woodbridge Township. The highways travel concurrently to New York City. US 46 in Palisades Park. The highways travel concurrently to the New Jersey-New York state line at the George Washington Bridge. I‑95 in Fort Lee. The highways travel concurrently to The Bronx, New York City. I‑95 in Old Saybrook. The highways travel concurrently to Old Lyme. I‑95 in New London. The highways travel concurrently to Groton. US 44 in Providence. The highways travel concurrently for one block. I‑95 in Pawtucket. The highways travel concurrently for less than 1 mile (1.6 km). I‑95 on the Westwood–Dedham city line. The highways travel concurrently to Canton. I‑93 / I‑95 in Canton. I-93/US 1 travels concurrently to Boston. I‑295 in South Portland. The highways travel concurrently to Portland. US 2 in Houlton. The highways travel concurrently through the city. US 201, from Brunswick, Maine, to the Armstrong–Jackman Border Crossing running south to north in east-central Maine. US 301, from Sarasota, Florida, to Biddles Corner, Delaware, along the Eastern Seaboard. The route closely parallels I-95 for most of its route and has numerous intersections with its parent. US 401 from Sumter, South Carolina, to Wise, North Carolina, near the Virginia border. For most of the route, it parallels US 1 about 10–20 miles (16–32 km) to the east, though the two share pavement in Raleigh, North Carolina. US 501 from Myrtle Beach, South Carolina, to Buena Vista, Virginia. The highway runs southeast-to-northwest, meeting its parent in Aberdeen and Sanford. US 601 from Tarboro, South Carolina, to Mount Airy, North Carolina. It runs mostly due south-to-north to the west of US 501, meeting the parent route in Camden, South Carolina. US 701 from Georgetown, South Carolina, to Four Oaks, North Carolina. Furthest east of the US 1 auxiliary routes, it never meets its parent route, but does intersect US 501 in Conway, South Carolina, and terminates at US 301 at its northern end. US 101, despite its number, is not an auxiliary route, but rather considered a primary U.S. Route in its own right as major highway west of the former US 99 on the west coast of the United States. The route in Richard Bachman's horror novel, The Long Walk (1979), begins each year at the Maine–New Brunswick border at 9:00 on the morning of May 1 and travels down the East Coast of the United States, along US 1, until the winner is determined. ^ American Association of State Highway and Transportation Officials. United States Numbered Highways (1989 ed.). Washington, DC: American Association of State Highway and Transportation Officials. Archived from the original on February 4, 2007. ^ "America's longest north-south highways". Times-News. Retrieved October 13, 2014. ^ "E. W. James on designating the Federal-aid system and developing the U.S. numbered highway plan". Federal Highway Administration. Retrieved August 9, 2012. ^ a b Rand McNally (1926). Auto Road Atlas (Map). Rand McNally – via Broer Map Library. ^ Google (August 9, 2012). "490 Whitehead St, Key West, FL 33040" (Map). Google Maps. Google. Retrieved August 9, 2012. ^ "US 1 Corridor Study". North Carolina Department of Transportation. Retrieved August 9, 2012. ^ Nirappil, Fenit; Hernandez, Arelis R. (December 31, 2018). "A plastic straw ban and a Confederate name change: New laws in the D.C. region in 2019". Washington Post. Retrieved January 3, 2019. ^ Rosenthal, Harold (1983). "Water tower in South Brunswick Township". Rutgers University Community Repository. doi:10.7282/T3N58JK0. ^ "Motor Sign Uniformity". The New York Times. April 16, 1922. p. 98. ^ "United States Numbered Highways". American Highways. American Association of State Highway Officials. April 1927. ^ Hart, Steven (2007). The Last Three Miles: Politics, Murder, and the Construction of America's First Superhighway. The New Press. pp. 1–5. ISBN 978-1-59558-098-6. Wikimedia Commons has media related to U.S. Route 1. Wikivoyage has a travel guide for U.S. Highway 1. 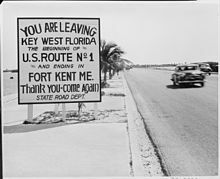 Weingroff, Richard F. "U.S. 1: Fort Kent, Maine to Key West, Florida". Federal Highway Administration. Retrieved August 29, 2014.